When choosing laminate flooring, it is a common misunderstanding that only the appearance matters and that all laminate is made to roughly the same standard and for the same purpose. However, in reality, nothing could be further from the truth. Most projects can be completed using laminate with an AC1 or AC2 rating, though AC3 would be the ideal recommendation. When purchasing laminate flooring, it is essential that you understand the differences in AC ratings (and what these mean) as these will directly affect which laminate should choose for your remodeling project. Laminate flooring is offered for sale with not only a number of finishes (appearance), but also with a number of different AC Ratings (Abrasion Classes), let me explain (below) exactly what this means, and why this is important when choosing the right laminate flooring for your project. Laminate flooring is made up of layers, with the wear and tear layer treated with aluminum oxide or melamine. This layer protects the laminate from wear, prevents fading, and keeps the flooring easy to clean while remaining stain resistant. Below the wear and tear layer is the decor layer, this is the layer that creates the finish look. Think oak, stained cherry, or even tile appearance. 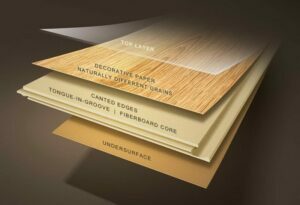 The core layer and the backer layer creates the resistance, support, and stability of the laminate flooring. When these layers have been molded together and tested, they are rated based on durability. The manufacturing treatment of the laminate flooring often determines whether a laminate is determined to be for domestic use or commercial use, the two most common pressure treatments I have summarized below. There is, however, a benefit of selecting direct pressure laminate, and that is that aesthetically it looks more like real hardwood. When the laminate is treated at a higher pressure than 500 PSI the flooring can lose some of its design appeal. High-Pressure treatment for laminate is usually only ever used when flooring is required with an exceptionally high durability because high foot traffic over the flooring is likely. High-Pressure Laminate is created using over 1,300 pounds of pressure per square inch (PSI). This pressure helps fuse the different layers of laminate together. This laminate will have a far greater durability, but for this higher rate of durability, it is likely the laminate itself will lose some of its visual appeal. What is the AC rating system for laminate flooring, and why does it matter? The AC rating system was created to give the consumer a better understanding of which laminate flooring is suitable based on regular wear and tear. These ratings are decided based on performance tests in many key areas, these areas include, staining, impact, heat, moisture scratches, and scuffs. How well the laminate performs in each of these predetermined tests will decide its AC rating. If a specific laminate does not make the minimum grade in any one particular area, it will be determined to be uncertified. Uncertified flooring is still sold, but it is safe to assume that these laminate floorings will not last very long at all and should not be considered for any project, no matter how small or seemingly insignificant. There are five different AC ratings. For example, AC1 indicates that the laminate is suitable for low traffic areas, whereas AC5 is for commercial use and high foot traffic. While not considered one of the five AC ratings I think it is essential to treat it as one. Any uncertified laminate flooring should not be considered for any project. Flooring of this rating would be ideally used in guest bedrooms and spare rooms, any room that has a relatively low amount of daily foot traffic. Laying this floor in high foot traffic areas will expedite wear and tear, and the flooring may need to be replaced. AC1 Laminate will almost always be considered direct pressure laminate (DPL). Laminate flooring assigned this rating should only be used in areas such as bedrooms and other relatively low foot traffic areas. While you could use this flooring in living rooms, kitchens, hallways and bathrooms in an ideal world selecting flooring with a minimum rating of AC3 for these areas would be a better choice. AC2 Laminate will almost usually be considered direct pressure laminate (DPL). Laminate flooring certified with this rating has been designed to withstand normal foot traffic in all areas of the house. The fewer residents the more likely that AC3 rated flooring will prove adequate for long-term use with limited wear and tear. AC3 Laminate will usually be manufactured as direct pressure laminate (DPL). AC4 Laminate will more often than not be manufactured as direct pressure laminate (DPL). AC5 – Designed to withstand heavy commercial traffic. Purely for commercial use, such as shop floors and other areas that receive a lot of foot traffic on a daily business. AC5 Laminate will likely have been manufactured as high-pressure laminate (HPL). Most laminate flooring projects on a budget can be completed using AC1 and AC2 rating standards, though to ensure your flooring is good for years to come AC3 standard would be the ideal recommendation. The latter choice will however almost certainly have a higher cost associated with it. Now that you fully understand the differences in laminate flooring, in terms of durability, you should have a good idea which AC rated flooring will be most suitable for your project. Of course, if remodeling a whole house or even multiple rooms, your selection may (and often is) a mixture of different AC rated floorings based on which rooms are your primary focus. Once you fully understand that not all laminates have been created equal, you are ready to move on to selecting your laminate style, finish and detail while considering the information learned above. If you are remodeling a home rather than a commercial premises (AC1 – AC4) you will have a far greater selection of laminate styles to choose from, as commercial laminates do not provide such a varied range for consumers.